If it looks like a duck, sounds like a duck and acts like a duck... it’s a duck. Some may cry fowl, but I think Barack Hussein Obama is the Devil. I don’t literally mean Lucifer, the brightest angel cast out from Heaven into Hell. Just one of his minions. We have a man who was educated as a child in Muslim schools. Who’s step-father was a muslim. Surely some of that wicked ideology rubbed off on him during those formative years. What person isn’t in some way influenced by the environment of their childhood? Obama proudly declares that he formerly used drugs in his autobiography. So he’s a criminal as well. Not convicted apparently, but still a criminal- because to use you have to possess. Of course, being a criminal in the Devilcrat party isn’t a big deal. There’s lots of lawbreakers there- ranging from those who patronize hookers to drunk drivers that have killed passengers and then used their family’s standing to get out of it. Oh, I know, Republicans also have criminals and sexual deviants in their party. And I know that all people are imperfect and make mistakes. But mistakes are a long way from out and out evil. 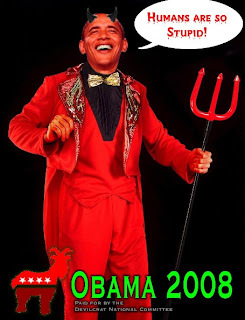 The final straw for me on the Demon Named Obama is his racist "former" minster, the Rev. Wright. For 20 years he sat in a Church that reverberated with speeches of hate, instead of compassion and remembrance of Christ. I wouldn’t have sat for 20 minutes in a place like that. Of course, there is more I don’t like about Obama. How in an election he didn’t have a clear win- he challenged vote results over and over until his opponent conceded. What a whiner. Or how when he was an intern at Michelle Obama’s lawfirm he had a dalliance with a superviser and eventually married her. Not exactly professional behavior. And I know that wanting to allow the murder of babies doesn’t singularly define you as evil. There’s always the chance you’re just stupid and don’t know any better. What really irks me about Obama is all the political correctness among conservatives talking about him. I’m sick and tired of hearing folks say that they respect him and love him as a fellow American citizen, but he isn’t the right man for the job. Even the great Ted Nugent, a man who I am proud to live in the same country as, declared (during a May 2008 Glenn Beck interview) his affection for Obama as a fellow citizen and American. I expected a statement like that from the kinder, gentler-than-me John McCain. But not Ted Nugent. Especially with Mr. Nugent’s everyday-rage against drug users. Conservatives have become a bunch of namby-pamby, pantywaists. Afraid to speak their minds about the evil of Barack Hussein Obama. Disgusting. Do they think Teddy Roosevelt wouldn’t declare Obama the flaming, hellspawn Mallard he is? A lot of republicans declare that they are better than name-calling. They talk about how Obama is a great dad. I really don’t care if Obama loves his children. I’m sure Satan has great affection in even his dark heart for cursed souls like Adolf Hitler. Tell me that there wasn’t some food that Charles Manson doesn’t love. Evil can love. But it is still evil. Devilcrats are quick to brand folks evil. I remember many a nut declaring Ronald Reagan to be the antichrist in the 1980s. George Bush likewise is branded evil on a daily basis. I know all about taking the high road, but some things you shouldn't ignore. The Republican Party wants to tell us how great John McCain and Sarah Palin are. Unless they also share the truth about how evil the alternative is, it seems kind of pointless to paint a picture of how great John McCain is. What happened to all the straight talk? 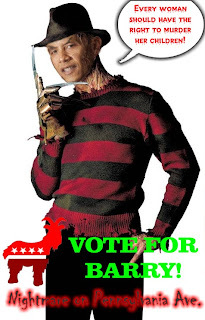 If America votes for Obama, then America deserves the consequences. I will never lie to anyone and say that Obama is a good person. I’ll admit he may be nice to his kids, but he is clearly evil in a way Bill Clinton, Ted Kennedy or even Nancy Pelosi could never truly fathom. Declaring anything else is just qwackers.